Teens are been given the chance to learn more about music through remixing via a government-funded website. Soundjunction, created by the UK's Associated Board of the Royal Schools of Music, lets people explore jazz, west African, and western classical. Three pieces were written especially for the site by musicians Jason Yard, Tunde Jegede and David Horn. The site aims to inspire people about music by letting them play around with different bits to create new pieces. "The essential basic idea was that it had to be a resource that would allow people to learn through listening, through creating, through discovery, rather a didactic written resource," said Derek Richards, project coordinator, from the Associated Board. The Soundjunction site has more than 50 hours of audio and video footage which help people learn about how musical traditions have been shaped through the ages. Hundreds of interactive articles explain the histories of different kinds of music, the lives of musicians, and how they were influenced and used in social and cultural contexts. There are also contributions from Britten Sinfonia, Seb Rochford from Mercury Prize-nominated band Polar Bear, Jamelia's producer Colin Emmanuel, aka C-Swing, and others. "The core audience is 13 to 18-year-olds, but the site, as we discovered through the phases of testing, can appeal to a wide range of people," Mr Richards told the BBC programme Go Digital. "The Associated Board has always had an interest in the role that digital technology and online technology can play in broadening, deepening and enhancing music education. "The question is when the technology and when marketplace, the audience, was at a right stage where it was feasible to deliver an application to work in that way." The site is being backed by Culture Online, a body set up by the UK's Department for Culture, Media and Sport, to broaden and increase participation and access to the arts and creative industries. The Soundjunction site is built around three core music pieces which were specially commissioned by Culture Online. The only musical starting point the composers were given was a single rhythm. The rest was up to them. Commissioning the pieces from scratch for this project meant there were fewer rights issues to sort out for use of the music online. The pieces by Jason Yard, Tunde Jegede and David Horn, reflect three musical traditions: jazz, west African, and western classical, respectively. The jazz piece also has heavy influences from urban black music genres, such as hip hop. The West African composition has also been influenced by reggae sounds. "They are not pieces that would immediately make a teenager sit up and think that sounds like whatever I am listening to at the moment on Radio One or 1Xtra or something," says Mr Richard. "But they are commissioned to be accessible and rich in learning. "In addition to those pieces, we commissioned remixes of those pieces where various composers, producers and so on have been invited to work with the parts of all three pieces to create new work." 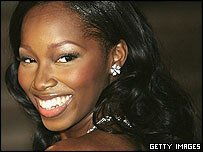 One of those remixes is by Colin Emmanuel, music star Jamelia's producer. He has bought in influences to the remix from R&B and broken beats. The explore section on the site lets users listen to the pieces in their entirety. But the pieces can be broken down so that people can just isolate certain parts of the track, or just particular instruments within a segment. Working with music in this way, through software like Cubase for instance, is part of the music curriculum already, according to Mr Richards, so young people are getting more familiar with seeing musical tracks broken up into their constituent parts. Apple's popular Garageband application is also moving into the classroom as a tool to make music. But Soundjunction is much broader than a program such as Garageband. "A teacher would immediately find on Soundjunction the resources with which to teach a lesson. "What would happen with Garageband is that you would use it to illustrate a point. It is a learning resource all by itself," explains Mr Richards. 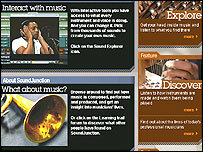 The difference between Soundjunction and other music software programs is that, where possible, plain English and simple instructions have been used to take people through the learning process. Users can select individual bars from any of the instruments, from within any of the pieces and copy them onto a clipboard. In composer mode, these selections can then be copied, moved around, and mixed up with other samples from within a library, to create something unique. As yet, the pieces which are created through this process cannot be downloaded because of complex rights issues, but Mr Richards said that side was being worked on. "Essentially, what we would have been doing is distributing the performances of the individual musicians over the net. "So we thought that at this present moment in time we thought it would make more sense just to allow people to simply share online." People can post their remixes onto a forum to share with others. "That situation might change," said Mr Richards. "One of the things that might lead it to change is that one idea we are quite interested in is letting people turn their compositions into ringtones for mobiles."